My dear readers, it's high time that we catch up! Pull up a chair and get comfortable. Go on, wrap your hands around a mug of coffee, or tea if coffee is not your cup of tea, or Diet Coke, or whatever favorite beverage you're drinking these days. Let's have a chat. Spring Break Has Arrived. After eight weeks of the semester, we've officially reached Spring Break. (And all the people said amen.) 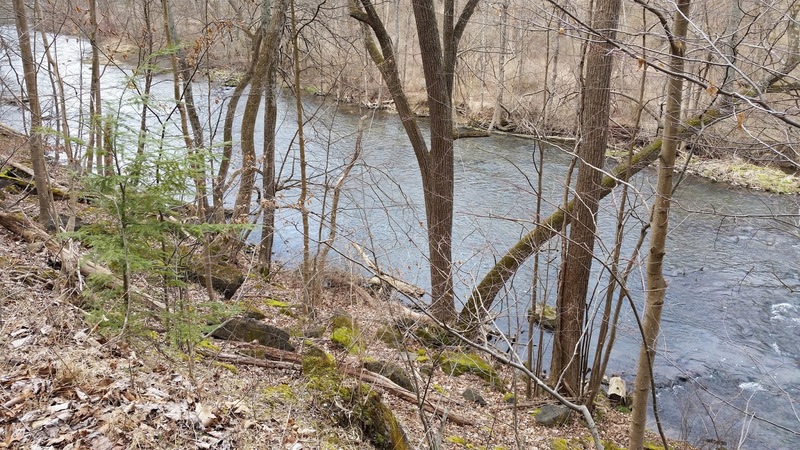 Over the past eleven years, I've accepted the fact that Spring Break in central Pennsylvania is neither characterized by spring, as temperatures still are crisp, nor a break, since there's a visible reminder of Work That Must Be Done sitting on my dining room table. Elementary School Recycling Unit Goes Awry. 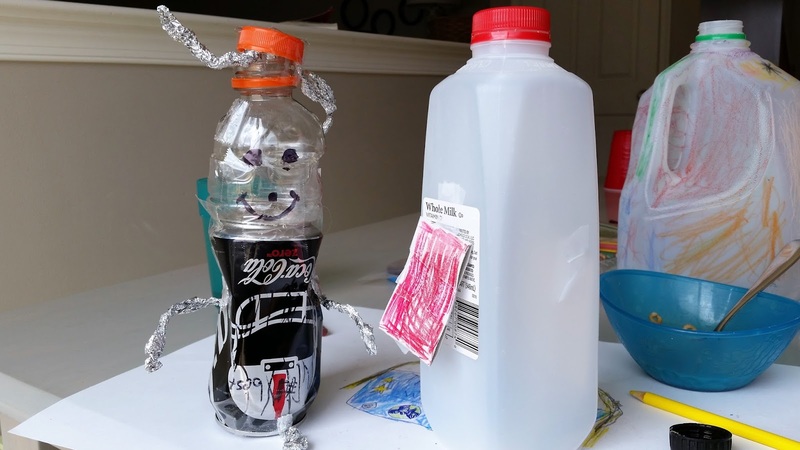 Ever since my second grader completed a unit on recycling, she's taken great pleasure in "rescuing" items from our recycling bin and repurposing them into craft projects. Nothing ever actually gets recycled in our house now, but we do have an entire army of Bottle Robots gracing our kitchen table. 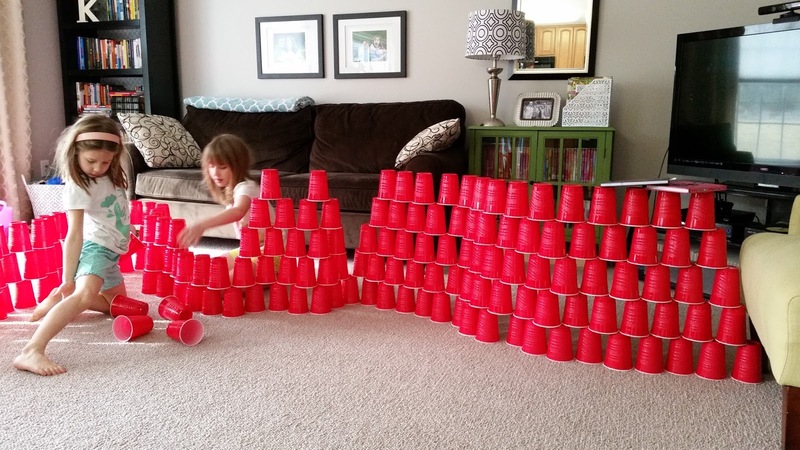 Great Wall of Solo Cups. Have you ever walked away from your children for ten minutes and, upon your return, discovered that they've redecorated? I don't know how my children stumbled upon a super-sized pack of red Solo cups in our pantry, but stumble upon them, they did. If You Give a Child a Waffle. If you give a child a waffle, she will want syrup. If you give her syrup, she will manage to get her hair sticky. If her hair gets sticky, she will find scissors and cut out a five-inch long chunk of sticky hair instead of, say, just taking a bath. 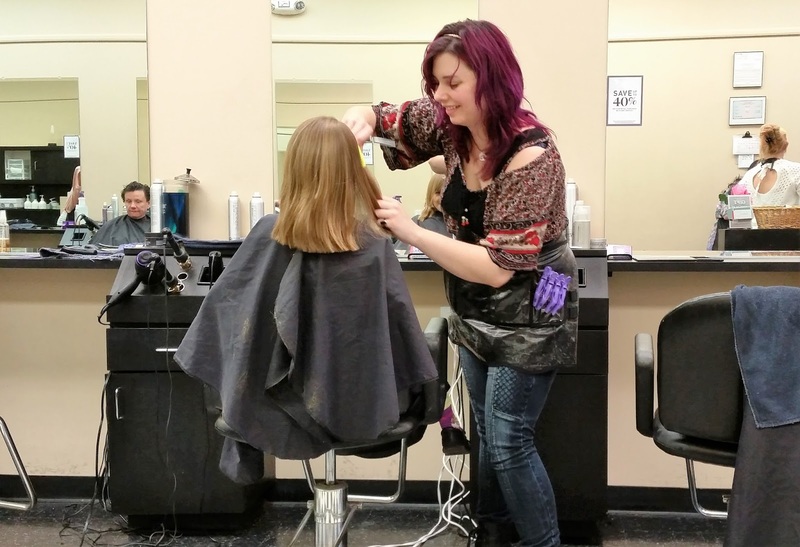 If she cuts out a five-inch long chunk of hair, you will visit the local salon where a friendly woman with purple hair will give your child a haircut to "even things out" a bit. The Right View Will Change Your Perspective and Day. 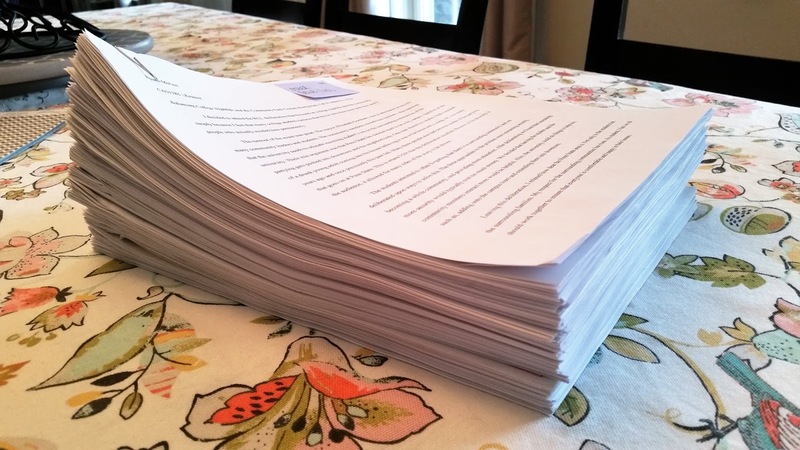 I'll admit -- with the stack of assignments glaring at me from their perch on my dining room table, and the clutter of recycled robots on my kitchen table, and the Solo cup fortress in my family room, and the unexpected trip to the salon after the syrup incident -- I felt frazzled yesterday. It's "break," but there's no visible reprieve. Given this, in the middle of the day I was grateful to steal an hour and return to one of my favorite running paths. With each mile, I felt my tension lessening. There's something to be said for changing your scenery and immersing yourself in beauty, even if just for a brief escape. I came back to the same house -- same work to accomplish, same sticky messes -- but I was more able to handle it. Even though I can't see it yet, I know that spring is coming. I can feel it in my bones: the tulips will bloom, the grass will revive from dormancy, the temperature will rise. And when that first "garage sale" sign is spotted (the truest marker of spring and pending summer), I'll know that we've truly arrived. It's coming, my friends. Spring is coming.